"Thank you for your offer of a camera. I have taken you up & got the latest German Leica with a very fast lens f:2 and 1/1000th sec. shutter. It's all metal, light & small & in fine shape. It is new though brought in by a D.P. I also got a relatively heavy tripod & a light meter..."
Jock began taking coloured photographs in April 1950 when he acquired a 35mm camera with the help of his father. The camera was a good one for the time, though a far cry from the digital ones of today. It was a view-finder camera with one permanent 50mm lens without a zoom. It had no built-in light meter and no flash. Its operation was totally manual. Changing a film involved rewinding by hand the completed roll of film, unscrewing to remove first the camera's leather case and then the bottom of the camera. 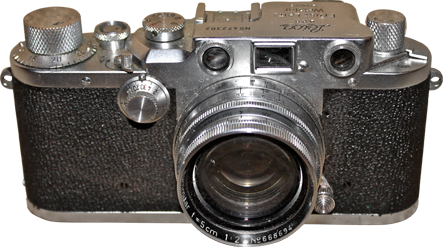 The old film canister was removed from the left-hand pin inset in the camera's base and replaced with a new canister. The new film's lead was then threaded into a vertical slot in the permanent right pin of the base and the pin given several turns to ensure that the film was gripped. Then the entire camera was reassembled. Despite the fact that better cameras, easier and faster to use came on the market, Jock continued with his old one for most of his life. Although he lived into 1993, he took few slides in the last 15 years of his life. In the early years, he bought and invariably lost light meters but later he simply guessed at the exposure, with remarkable accuracy. He may have abandoned regular use of such meters by 1959. When he was in Antarctica in December 1958, he found this instrument virtually useless either because the light was too bright for readings or the temperature too cold for it to work. The incentive for acquiring a camera that would take good-quality colour slides was his forthcoming first trip around the world between the beginning of the months of June and November in 1950. Before he left he took several rolls of colour positive film by different manufacturers in order to assess which type he preferred. Judging by the state of the resulting slides today, his choice of Kodachrome, invented just 15 years previously, was sound. It remained his film of choice through out his life. Kodachrome ceased to be made about 16 years after his death. Jock stopped taking slides and using his 35mm camera in the early 1980s. He then began using a simpler camera that used a different size of film and produced colour negatives from which colour positives were printed. Being in his mid-70s by then, Jock was travelling less mostly revisiting places for pleasure with his wife.